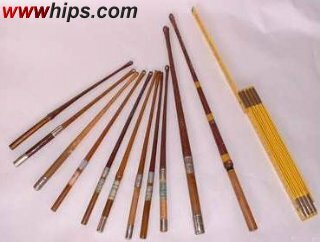 These are model driving whips, made as samples by a German whip manufacturer in the small village of Killer, which was the centre of whip manufacturing before the war. In that time, these little models were used instead of a catalogue to show the manufacturer´s product line. The models are scaled down to 1/5 original length (=25-41cm or 10-16") by half original diameter and are made of the same materials as the original product. Some of the models are labelled with type and ordering number.